On Tuesday, we had a birthday lunch for one of our office volunteers. The theme was “potatoes” as in, we were supposed to make a dish with potatoes as the main ingredient. Now, I love potatoes, as evidenced here, here, and here, but I wanted to shake it up a bit – if you can call cauliflower shaking it up – and make a faux potato dish, low in carbs, but full of flavor. I’ve made versions of this recipe for over 10 years, adding more or less of this & that, but this version is my favorite, and as far as I can tell, I’ve yet to have someone not like it. Beware, however, this is RICH, so a little goes a long, long, long way. While cauliflower steams, cream together 6 oz of the shredded cheddar, 6 oz of the Monterey Jack, and softened cream cheese. 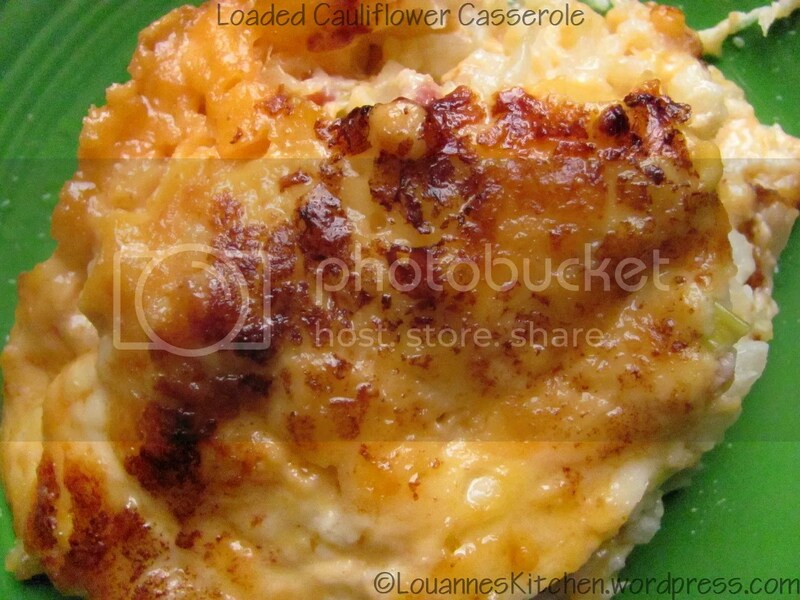 Drain steamed cauliflower and add to cheese mixture. *For a creamier texture, add in the 1/4 heavy cream. Pour into a 2-3 quart casserole and sprinkle on remaining cheddar and Monterey Jack cheese. 6 servings at 6.4 net carbs. ©Louanne Bertrand and Louanne’s Kitchen, 2010-2014. Unauthorized use and/or duplication of this material without express and written permission from this blog’s author and/or owner is strictly prohibited. Excerpts and links may be used, provided that full and clear credit is given to Louanne Bertrand and Louanne’s Kitchen with appropriate and specific direction to the original content. Omg I made this tonight and it was the BOMB!!!! Hi! 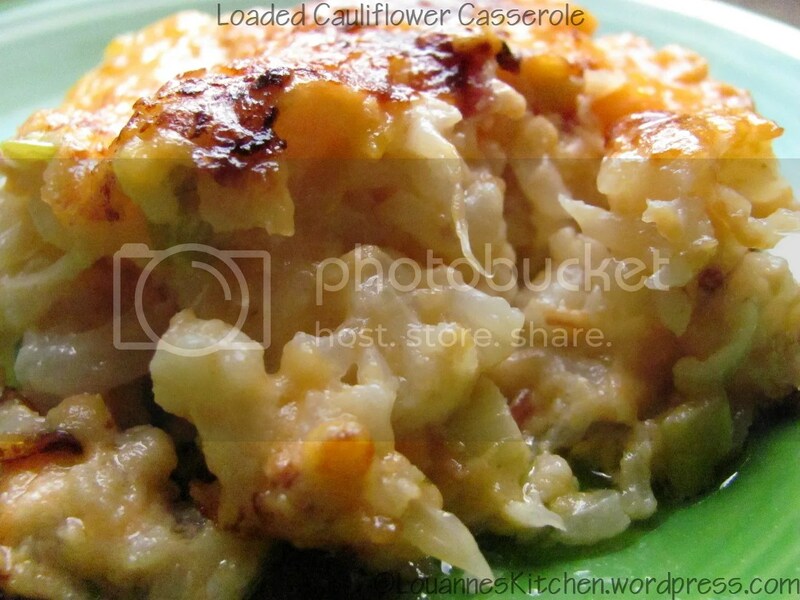 Could you use frozen steamable cauliflower for this recipe?? Or does it need to be fresh? Wow this is absolutely amazing!! I believe it will be my new favorite low carb dish. We mixed it with sliced grilled chicken. My daughter couldn’t believe how close to potatoes it tasted. Made this dish once and it was excellent. Second time I messed something up! When you say “cream” the cheeses together, does this mean to melt them and make a sauce? Was awesome the first time and can’t remember what I did differently! Delicious! My family and I loved it! How many calories for 8 servings? Hi there! For those of us living where there is no Monterey Jack cheese, whith which other cheese can we substitude that foThanx a lot! I’m not seeing the difference between the two different recipes you posted? What makes the second one lower carbs? Sorry about the delay. Anyway, yes, I’ve frozen leftovers before, but once thawed and reheated, I felt the texture suffered. Everyone else said it was fine – I do have “texture” issues. Since then, I just halve the recipe if I know we won’t eat the entire casserole within 2-3 days. Excellent! Thank you, for such a quick response. I can’t wait to make this. So glad that you all enjoy it! I often make it sans bacon. Thanks for visiting! Weight – I shred an 8oz block of each cheese. Enjoy! I’m excited to be making this tomorrow for my daughters birthday, but I wanted to clarify the ingredients. Do mean 8oz in weight of cheddar and jack cheeses, or 8 oz in volume? It probably seems like a silly question, but if I put in 8 oz in weight of cheese, that means 2 cups each of the cheddar and jack cheeses; if I use 8oz in volume, it means only 1 cup of each cheese. That’s a huge difference. I’ve been making this for months and my kids love it more than mac & cheese. I make it without bacon and take it to our monthly dinner at our synagogue and everyone there also loves it (it’s perfect during Passover). You’re welcome! Have a great BBQ! I’ve never used the slow-cooker for this dish, and my instinct tells me that you might end up with cheesy mashed cauliflower – not a bad thing ☺ – since the cauliflower is pre-cooked. However, if you steam the cauliflower until just tender, assemble the recipe, and set the slow-cooker temperature to low, the cauliflower could keep its integrity. If this is the only side-dish, you may want to double the recipe for 20 people. As for size, I’d definitely use a 6 quart if you double the recipe. hello, i have been searching for a hit keto crock pot dish. I am hosting a family (potluck) BBQ this weekend and want to serve a keto side dish (I started keto) that everyone will love. people arrive at different times so i want to use my crock-pot to keep it warm. 15 to 20, I may buy another crock pot? Should I double this recipe? Can I cook it in crock pot? Should i bake it, then dump it in crock-pot? I am not a cook, so this may be stupid question? This sounds like a hit recipe and will go with the hot wings and BBQ burgers and rest potluck things i think. Any advice would be very much appreciated!! Hi Ryan – glad you found me ☺ Good luck with the low-carb lifestyle – I fall off time and again, but always find my way back! I’m not gonna lie, I nearly had a heart attack when I couldn’t find this recipe again after falling off the low carb wagon for about 9 months. After 45 minutes of searching, obviously, here I am. Just wanted to say thanks for posting almost 5 years ago now. I love this dish more than any other low carb/no carb recipe! Simply sublime! It was a complete hit! Better alternative than potatoes, we’re having it again by request! Thank you, Anise! I like it with simple grilled or baked chicken or fish. It’s delicious with pot roast, too. Enjoy! Louanne, What do you suggest serving with it? This recipe looks fantastic! It’s very rich, so at least 8.
how many does the recipe serve? Having a potluck tonight! Yes, the casserole can be made the day before and baked before serving. Yes, absolutely, when I make it, I always have leftovers. After cooking it, if I have left overs, can they be put in the fridge? Not sure of what you mean…making ahead and baking later or freezing it? Can this be stored for later use? Perfect recipe! I’ve made this over and over, and sometimes for people who wouldn’t touch cauliflower otherwise. Each time, people clean their plate and ask me for the recipe. It’s a go to for us. Thanks for sharing! does it count as an S recipe? Just curious..I am making it now but have modified the recipe to what I had in the house:) Smells wonderful! This is an original Louanne’s Kitchen recipe created by me, Louanne, and posted on June 24, 2010. Thanks for letting me know – this recipe has made the rounds, let me tell you. Have a great day! And, I’m so happy you enjoy the recipe! Hey Louanne: this is really weird but I SUPER love this recipe (that’s not the weird part!) and was going to my Pinterest board to find it again. When I clicked thru it, it went to a Food Network recipe. I didn’t think it was from FN but started reading and sure enough, it’s the wrong recipe. Plus, it didn’t have your picture of the food on top. I thought this was really weird so I did an image search of your photo (the one on my Pinterest board) and it came up on SEVERAL sites but I finally found yours & remembered your blog post & ingredients/directions. Anyway, I went back to Pinterest and changed it to your correct link. But just wanted to let you know—I don’t know if it was just a weird thing of if it’s been happening on Pinterest and/or w/recipes. Anywhoo. Crazy. Thanks, Annette! So glad you enjoyed it! Hi Louanne, I just had to stop by and tell you how great this recipe is! I’ve had it in my recipe file for a while and finally made it tonight. It was a HUGH hit! The whole family loved it! Thanks so very much, it is definitely going in the rotation! This is my absolute favorite dish ever!!! I make it at least once a month! However I thought there was cream in the recipe? Sorry i didn’t see where or how much cream that goes into the recipe. Hi Kacey! Yes, it’s definitely a rich dish 🙂 Thanks for letting me know, and I’d love to see your version of the recipe. I searched your new blog for this recipe because I wanted to share how great it was! I changed it up quite a bit as the first time I made it I felt it was a little too rich. I roasted my cauliflower with a ton of garlic first, reduced the cream cheese by half, and upped the cream to 1/4 cup. I hope to post an entry of my variation of the recipe this week on my blog. Thanks again for the recipe! This looks really good. Will have to try and see if the kids eat it! It's so bad yet so good at the same time – lol! I love cauliflower! This looks insanely rich and delicious! Wow! This is probably the best way I can think of to eat cauliflower! 🙂 It looks delicious!